Each year, the Arts Co-op Program recognizes two iSchool co-op students for outstanding achievement in all aspects of student performance, including academics, the workplace, and professional and/or community involvement. This year, Helen Brown was awarded an Honourable Mention in the Master of Archival Studies program. As a Student Archivist with Library and Archives Canada (LAC), Helen was responsible for several projects, including a detailed disposition analysis that would allow archivists to consolidate archival Department of National Defence files stored at the Winnipeg Regional Service Centre. Her supervisor, David Horky, praised Helen for her “exemplary” performance in the workplace. Helen is also active in student professional development as the 2011/12 Co-President of SLA@SLAIS and the 2012 iSchool student representative on the SLA Western Canada Chapter Board. 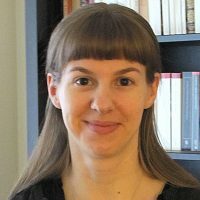 In her role as Student Archivist in the Library and Archives Canada’s Winnipeg office, Helen discovered how to apply the theories learned in iSchool classes to actual work projects. A key project that Helen worked on was the creation of a multi-purpose database for classifying records from the Department of National Defence. David commends her for her “outstanding ability to integrate several tasks” in this database, including disposition analysis, intellectual control, and preliminary arrangement – all of which will be a “powerful” reference point for current and future DND records. This work term with LAC increased Helen’s awareness of the archival profession and archival work. Through weekly meetings with archivists and institutions across Canada, she was able to speak with several professionals in the field and gain a better understanding of where she might enter the profession. Equipped with this new knowledge, Helen says she is now able to draw on both her professional experience to supplement her studies, and to focus her academic projects to fit her career goals. After her term with LAC, Helen decided to take classes in access to information legislation, advanced records management, and French to supplement her professional development. The co-op work experience she gained has opened Helen to further job opportunities in the LAC Federal Records Centre in Burnaby and the Playwrights Theatre Centre in Vancouver.